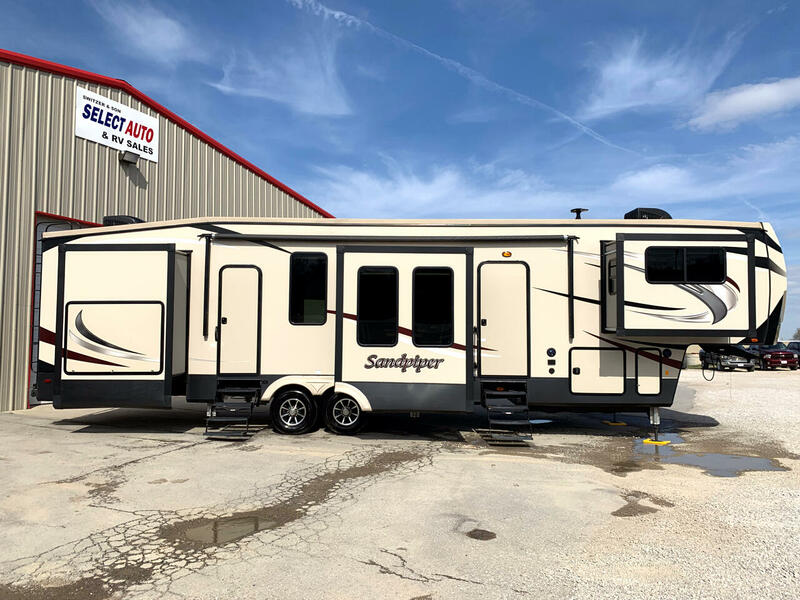 Here is a 2018 Forest River Sandpiper 379FLOK with 6 Slides. The arrangement of this unit is with the Front Living Room. This is a 4-Season Unit. The dry weight of this unit is 12,819lbs. Everything works as it should. It is like new in every way. Here is a list of some of the options on this rig. Leather interior, Sleeps 6, Ducted Heat, 2 Ducted Roof Air Conditioning Units, 3-Burner Stove with Oven, Microwave, Large Shower with Glass Enclosure, Washer/Dryer Prep, Alloy Wheels, Large Power Awning, 6-Point Auto Leveling System, Out Side Kitchen with Refrigerator, Sink, Storage, and Microwave, Residential Side By Side Refrigerator, King Size Bed, Island Kitchen, 10 Gallon Gas/Electric Water Heater and so much more. Message: Thought you might be interested in this 2018 Forest River Sandpiper.